Disclosure: I receive no compensation for any links from this post. I found them on Google. They aren’t compensating me for name dropping them either. Messing with 0% APR Cards is dangerous – be responsible and be careful. One day I’ll get to part two of my credit card tier list. In the meanwhile, a friend of mine asked me if I knew of any good 0% introductory APR credit cards, no annual fee cards so I promised him I’d do some research for him. I generally don’t even think about these things because I don’t believe in ever carrying a balance – but his reasoning for wanting that leeway sounded generally sound and he doesn’t want to take any balances he may build up past the introductory period (though the danger of not paying it off in time is always there). He was looking for rewards cards, though not necessarily the travel variety. A couple of big bolded warnings before I get to my research. – Carrying a balance is always dangerous: The credit card industry is built on people wanting to spend more than they can afford. Even at a 0% intro APR, it’s dangerous to keep a balance if you’re not disciplined and don’t pay it off in time. – Carrying a balance on a rewards card is even more dangerous: When I started doing my research, I saw some 0% intro APR cards that had no rewards at all. In my head I was like, why the heck would anyone get one of those? But then I realized my paradigm is different – I never carry a balance and I just see credit cards as a means of getting rewards. However, if you don’t have the discipline to pay off in full (or are carrying a balance because you need to during the intro 0% period) – having a rewards card is risky. Simply put, you are “getting” something while still carrying a balance and that could tempt you to keep spending on the card and add to that balance. On the cards with no rewards, you’re basically getting nothing in return so you might be prone to pay it off quicker. – Applying for credit cards can be dangerous even for the fiscally responsible: Those of us heavy into the miles and points game generally have systems to make sure we don’t miss payments and always pay in full, but even the bets of us make mistakes. I certainly do. There have been a lot more posts on this matter recently, these two are two that I remember catching my eye (sorry to others I’ve missed). So if you’re going to apply for a 0% APR card – make sure you have the discipline to use that “free” loan correctly – pay it off before the interest kicks in. Otherwise you might find yourself in trouble. Please be responsible. I haven’t included affiliate links for any of these cards – this is my pure, objective research that I thought might help responsible people in specific situations (like my friend). Make good choices! I’d say one card doesn’t really fit all, though I have some favorites. I’ll quickly run down the pros and cons that I see for each card (if I were applying personally). I’ve stated before that I’m not a huge fan of Amex EveryDay, but if you are looking to transfer to airline partners like Delta or British Airways that might be the card for you. Some tips on how to redeem those pesky miles if you’re interested. There’s a version with an annual fee as well that’s slightly more lucrative. 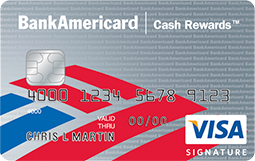 The Bank AmeriCard Cash Rewards card has the benefit of an easy to clear sign up bonus, though it’s earning power doesn’t really blow my mind. 3X on groceries is nice – but how much groceries do you really buy? And since this post is for people looking for 0% APR cards I wouldn’t recommend Manufactured Spending in any way shape or form – too tempting. Not that 3X is a gamechanger anyway. 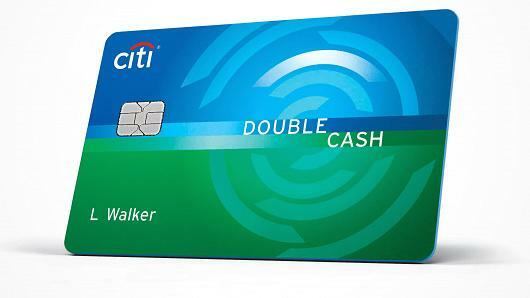 I feel the same way about Blue Cash as I do the Bank AmeriCard Cash Rewards – just nothing amazing enough to make me really want it. I like it even less for my friend because the 0% period is only six months. I’d prefer the version with an annual fee that offers 6X at grocery stores. 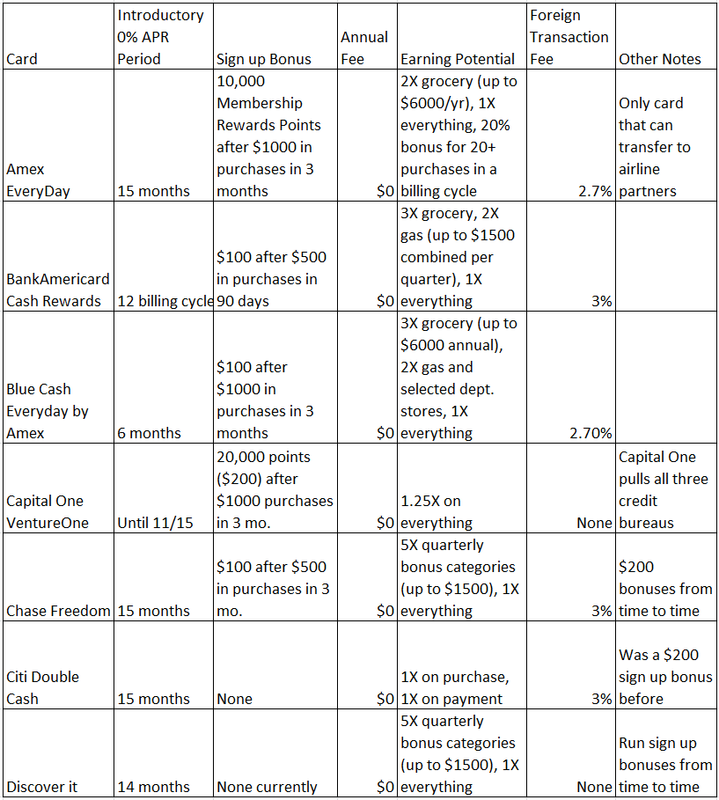 The Capital One VentureOne card has the benefit of no foreign transaction fees if you travel a lot, but 1.25X is a mere pittance in the rewards world AND Capital One takes your credit from all three agencies. Hard pass. Originally when my friend asked me the question, he was leaning towards Double Cash due to the 15 month 0% APR and I said it probably was a good card for him. But the lack of a sign up bonus and the whole “1% when you buy and 1% when you pay off” thing really turns me off. I’d like this card more if there was a sign up bonus but I can’t currently find one. 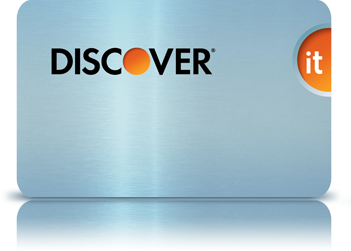 Chase Freedom and Discover it are probably my favorite cards out of the bunch – they both offer 5X rotating categories and 1X on everything else. I’d give Freedom the edge right now because it has a sign up bonus and I like Chase as a bank (it’s good to build a long term relationship with them) – but Discover has the benefit of no foreign exchange fees and its bonus categories tend to dovetail more with my personal spending. For the responsible miles and points enthusiast who is paying their balances off in full – most of these cards are probably niche cards that have specific uses. 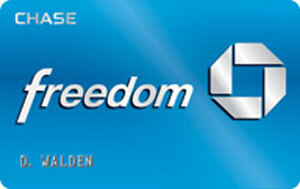 However, if you’re looking for a 0% APR card, I’d lean towards Freedom or Discover it. Hopefully the chart is helpful as you start your research – I’m sure some people will find cards that better suit their needs. It bears repeating – if you need the 0% loan – truly evaluate how important that is to you and be careful about how much of a balance you build up. Fiscal responsibility is more important than few rewards here or there. Anyway, to my buddy – hope this helps! Make good choices!